See December 2005 Issue of HDT. Our unique pallet jack stop was designed to eliminate freight and trailer door damage due to runaway pallet trucks. It's easy to use, easy to store and it protects valuable freight and equipment from damage caused when a pallet truck drifts. Our pallet jack stop is ideal for trucking companies, freight carriers, and other material handling customers that need to secure their pallet truck. "Articles of cargo that are likely to roll must be restrained by chocks, wedges, a cradle or other equivalent means to prevent rolling. The means of prevention of preventing rolling must not be capable of unintentionally unfastened or loose while the vehicle is in transit." Save your load bar for your cargo. Avoid citations that could cost you hundreds of dollars! Secure your pallet jack with Stop N' Hold. STOP N’ HOLD® is lightweight (weighing about 3 lbs.) 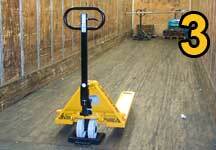 and easy to use allowing any freight carrier to easily secure their pallet truck during transit. This unique and inexpensive product is an ideal solution for the trucking and freight industry. 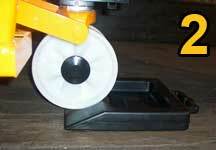 STOP N’ HOLD® holder available for pallet trucks. The convenient holder assures that you do not misplace your STOP N’ HOLD®. Be sure your STOP N’ HOLD® is where you need it when you need it with this convenient holder. 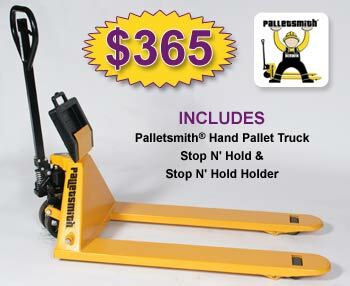 Palletsmith® 5500 lb. capacity hand pallet truck with integrated Stop N’ Hold® and Stop N’ Hold® Holder is designed to meet the demanding requirements of the trucking industry. Each Palletsmith® features a reinforced frame with poly on steel wheels and poly on steel rollers. To learn more, go to www.palletsmith.com. Call 1-800-336-5438 or place your order below. We are VERY impressed with the Pallet Jack that we sent on the route, this week. The driver raved about the "feel" and quality of the unit and its construction. Also, the 'STOP N' HOLD' proves that simple, solid engineering and innovation is alive and well. That thing is freakin' awesome..! I drive for Ward Trucking and, as you know, we use your Stop N' Hold. I am on the terminal run and do not ordinarily unload trailers with pallet jacks. My boss recently asked if I would work the city a couple weeks. It was the first time I got to use the Stop N' Hold! I was impressed! I wish you would have had them 30 years ago! I've seen many a trailer door cracked or busted, skids sliding around that were used to hold jack, and trailer and freight damage from the pallet jack turning upside down and sliding. In my weeks of driving a local run, I had people asking about the Stop n' Hold. I told them about and it and I also told the managers that would have a interest in this. I gave them your 800 number and your website. I talked to Ed Slater, Pittsburgh Ward boss, and he gave me a run down on the testing and development you all did. Great Job! I will never be able to say enough good on the Stop N' Hold! This can and will save lives! Ever see a pallet jack come out of trailer and land in car? Not a good thing. I wasn't sure on how to use it, so I put in the skid then backed up in to the Stop N' Hold. Then I found out you can put anywhere in the trailer with just the Stop N' Hold and it will stay where you put it! Amazing! Did I say I was impressed? I AM! Sorry for the long winded story, I just had to share my thoughts on this! Job well done on a product that really works! I did share this with a terminal in Chicago that I go to, they liked it an hopefully are in contact with you. I would like you to send me some info sheets and business cards. I am not a salesman just a guy who likes to help others out and I really feel the trucking industry needs to know of the Stop N' Hold! Harry E. Smith & Associates, Inc.
Use this form to send us your comments or questions. We'll be in touch with you soon.